So many good ideas, so little time. We were thrilled to hear about a proposed cycle tunnel in the city of Bodø, Norway. The city wishes to become a cycling city on a par with many other European cities. 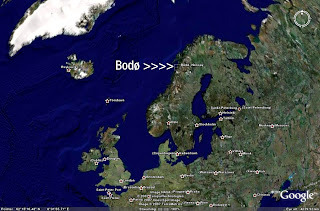 The main hurdle is that Bodø is located in the far north of Norway, at the mercy of North Atlantic and, worse, Arctic winds. Hurdles are, however, meant to be jumped over. This is Scandinavia, design capital of the known universe, so some clever thinkers starting jumping. Bodø has a population of 40,000 wind blown inhabitants and the idea is to build an 8 km long tube from the city centre to the College of Higher Education. Clear plastic plates would be used and openings would provide ventilation. It's all still being decided, as far as we can see, but the idea is great. Read more about it here. It reminds us of an idea for a Danish bridge - Storebæltsbroen - when it was being planned. At that time it was to be the longest bridge of it's kind in the world. Some bright minds proposed cycle tunnels in both directions - so that the bridge and tunnel were not just for traffic and trains. And get this detail: the idea was to have automated vents at intervals along each tube that would rotate to catch the current wind direction and provide cyclists with a constant tailwind. What an idea. This one died on the planning table, however. If anyone has more info on this design idea, please let us know. We couldn't really find any leftovers about it on the internet. All of this cycle tube talk made us remember the dear old Rhinoceros Party of Canada - an actual political party in Canada from the 1960's through to the 1990's which endeared itself to many for it's absurd political platform promises. One of them was to bulldoze the Rocky Mountains and use the rock to build downhill bike paths from coast to coast - which would also give the people of Alberta a view of the sunset on the Pacific. See their wikipedia entry for more laughs. More visionary ideas. Know of any more? Do let us know.